^ a b Editor: Alvin M. Josephy, Jr., by The editors of American Heritage Magazine (1961). “The American Heritage Book of Indians”. In pages 174-219. ,. American Heritage Publishing Co., Inc..
^ a b Trigger, Children of Aataentsic, 27. ^ Vogel, Virgil (1986). Indian Names in Michigan. Ann Arbor: University of Michigan Press, 1986. ^ Hey, Chester Andrew; Eckstein, Norman (1959). Huron County Centennial History, 1859-1959: Hi-lights in 100 Years of Progress. Harbor Beach Times. https://books.google.com/books?id=SYnhAAAAMAAJ. "The Indian language contained the word, Ka-ron, straight coast or shore and Tu-ron, a crooked or winding coast." ^ a b c d e Dickason, "Huron/Wyandot", 263–65. ^ a b c Gary Warrick, "European Infectious Disease and Depopulation of the Wendat-Tionontate (Huron-Petun)", World Archaeology 35 (October 2003), 258–275. ^ Garrad and Heidenreich, "Khionontateronon (Petun)", Handbook of North American Indians, Smithsonian Institution, 394. ^ "Father Francois Joseph Le Mercier", The Jesuit Relations and Allied Documents, XIII, 103-105. ^ a b Heidenreich, Huron, 369. ^ Labelle, Kathryn Magee (Autumn 2009). “"They Only Spoke in Sighs": The Loss of Leaders and Life in Wendake, 1633-1639”. Journal of Historical Biography 6: 1–33. http://www.ufv.ca/jhb/Volume_6/Volume_6_Magee.pdf. ^ Weslager, C.A. (1972). The Delaware Indians: A History. Rutgers University Press, pp. 399–400. ISBN 0-8135-0702-2. ^ Conrad E. Heidenreich, "Huron", Handbook of North American Indians, ed. Bruce Trigger, Vol. 15, Northeastern Indians, Smithsonian Institution, 1978, p. 378. ^ Heidenreich, Huron, pp. 380, 382–83. ^ Heidenreich, Huron, p. 383. ^ Heidenreich, Huron, p. 380. ^ Heidenreich, Huron, p. 381. ^ Heidenreich, Huron, p. 385. Dickason, Olive Patricia. "Huron/Wyandot". Encyclopedia of North American Indians, 263–65, Ed. Frederick E. Hoxie. Boston: Houghton Mifflin, 1996. ISBN 0-395-66921-9. Sagard, Gabriel. Le grand voyage au pays des Hurons. Vol. 1; Vol. 2. Paris, 1632. Steckley, John. "Wendat Dialects and the Development of the Huron Alliance"
Trigger, Bruce G. The Huron: Farmers of the North, New York: Holt, 1969. ISBN 0-03-079550-8. Axtell, James. The Indian Peoples of Eastern America: A Documentary History of the Sexes. Oxford University Press, 1981. ISBN 0-19-502741-8. "Hurons" . Collier's New Encyclopedia. 1921. Jones, Arthur Edward (1913). 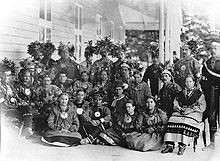 "Huron Indians" . Catholic Encyclopedia (in English). "Wyandot" . Encyclopædia Britannica (in English) (11th ed.). 1911.